Cool Glamour rugs by Esprit Home. One of our premium hand-tufted sparkle collections. The long spaghetti like pile is heavy and dense making this range ultra weighty and super luxurious. There are seven plain colours and two patterned designs to choose from, each colour is hand-woven into seven different sizes. 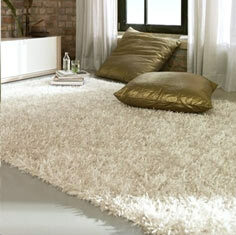 Cool Glamour rugs are made in large sizes and even a square rug.